For me, by far the most irritating thing about winter is the short days… well, that and having to wash your bike the whole time. The weather actually doesn’t bother me too much; I’m used to it, I’ve plenty of really good clothes to wear and getting muddy is an integral part of riding mountain bikes and cyclocross anyway. The most obvious way of finding more time to ride in these winter months is by getting a really good set of lights, and happily, I’ve had those for road cycling for a long time now. 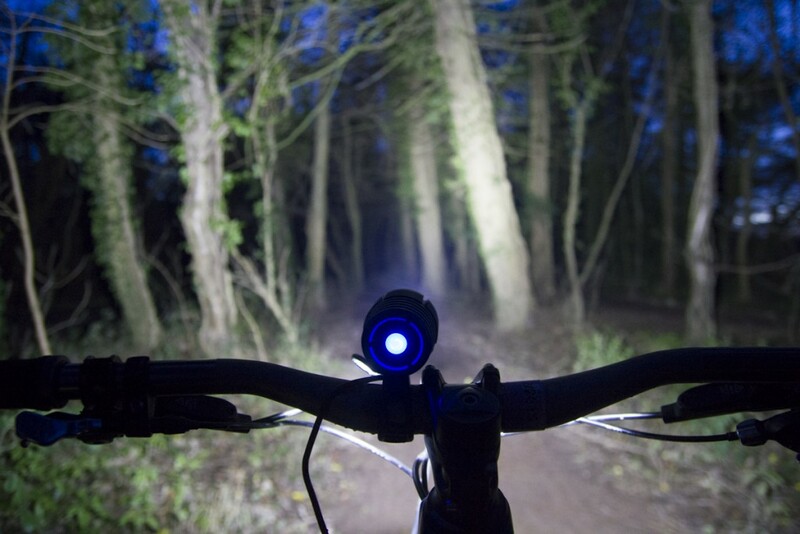 Mountain biking at night is a bit of a new one for me though; I’ve always been too horrified by the price of off-road bike lights to ever invest in any! On my British Cycling Mountain Bike leader course, I had a conversation with a couple of riders about what lights they’d recommend and the first guy suggested one that costs £400, then the other chap recommended a ‘cheap’ light that ‘only’ cost £200! Bonkers! Neos Cycling sent me the UGOE 6000LM Alloy CNC Front and 150lm rear high power light set to try out and though they’re still a price that will make you carefully consider your purchase – £160 – they work so brilliantly that they may be worth it. 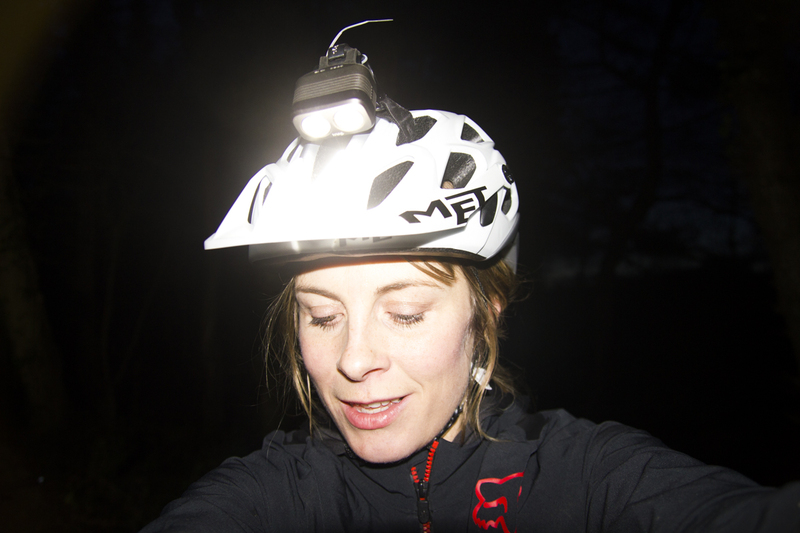 The set is a killer piece of kit for off-road nighttime adventures – the lights that are so bright you’re not even allowed to use them on public roads! The lights arrive in a snazzy box, which not only makes you feel that you’re getting something fancy for all that loot, but also ensures you don’t lose any of the bits and pieces. Inside, you’ve got a massively powerful 6000 lumen front light, a 150 lumen (red) rear light, a rechargeable 7.4V lithium polymer battery, charger and assorted rubber mounting brackets. You also get a remote control for switching wirelessly between settings on both lights. Pretty cool, huh? Charging was a straight-forward affair – just plug in and leave for 4-6 hours – then all you’ve got to do is fasten the battery pack around your top tube using the Velcro fastening and attach the front and rear lights to your handlebars and seatpost. It all takes about a minute. 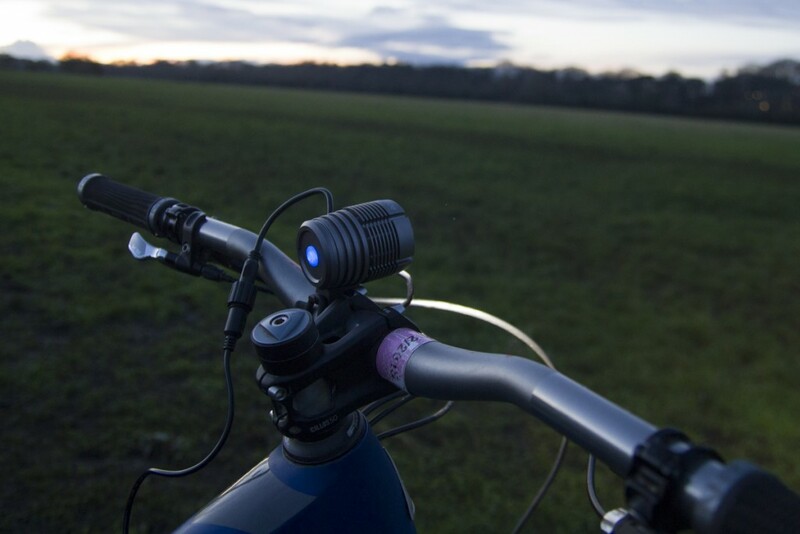 The casing of the light is made from anodized Aircraft grade aluminium, and is tough, durable and waterproof. The leads and input points are good and sturdy. So how do they perform on the trails? I was mightily impressed with how much I could see – on a pitch black, moonless night, the entire trail was light up as clear as day, with the light on the full power setting. I actually tended to use the mid-power setting most often, as it’s sufficiently bright. 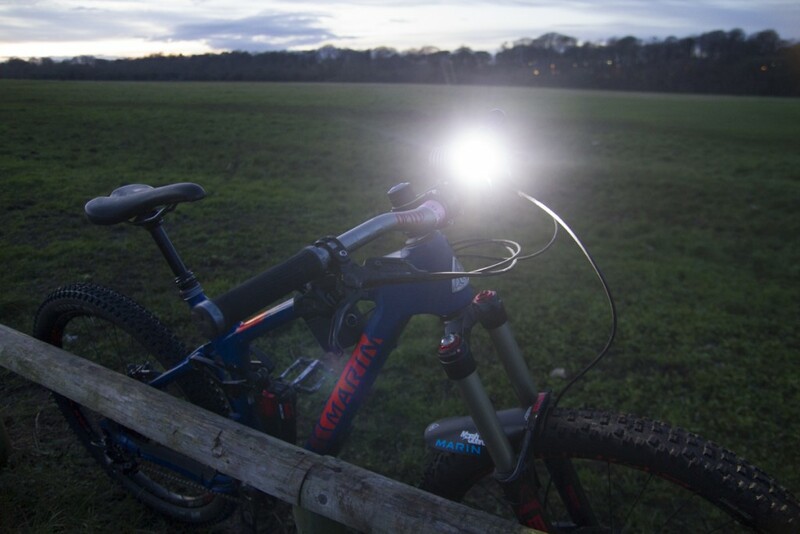 The beam is clear and ultra wide, making it ideal for cross-country or downhill mountain biking as you get a good sense of what’s around you, rather than just ahead of you. On full power, the battery life is about 2.5 hours, and on medium, I haven’t actually run it out on a ride yet. You’ve also got a low beam mode and a flash mode, though why you’d ever want a flash mode when you’re riding off road in the dark, I don’t know. 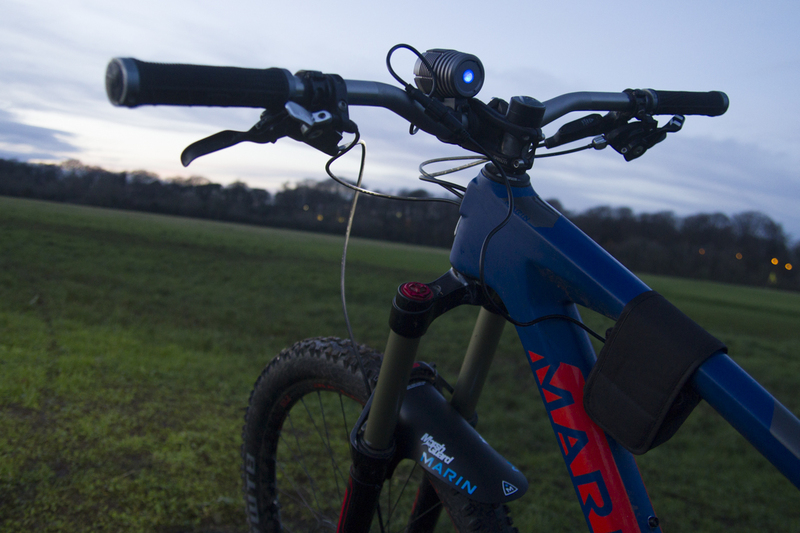 At the rear, you’ve a much lower power red light to show fellow trail users where you are without blinding them. I attached the battery pack using the Velcro and was a bit concerned that it would flap about, fall off or get in the way. It did slide down the top tube, away from the handlebars, settling in what turned out to be a better place nearer the downtube. It stayed well put in that position so I always mounted it there afterwards. I never had any problems with the pack falling off, though if I was racing I’d probably put a couple of cable ties around it, just to be super sure it was 100% secure. I’d also put one towards the front of the top tube to keep the cable nice and neat against the frame. 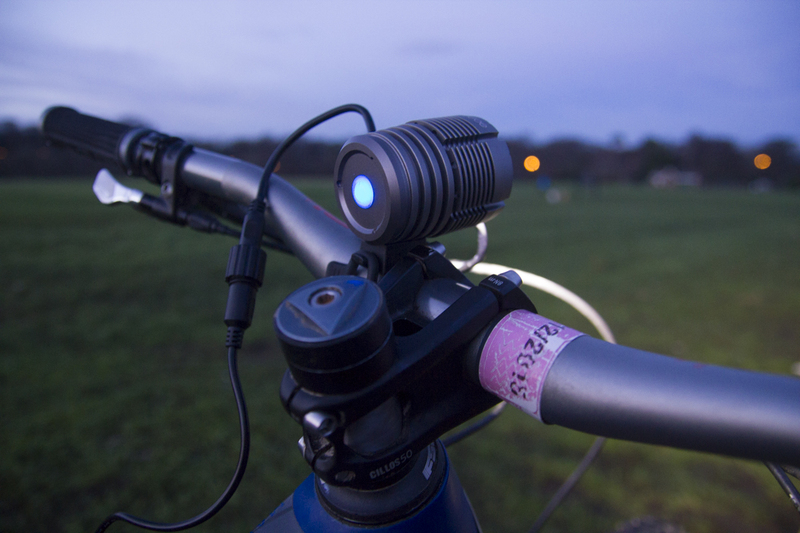 If you mount the light on your helmet rather than your bars, the remote control is great. 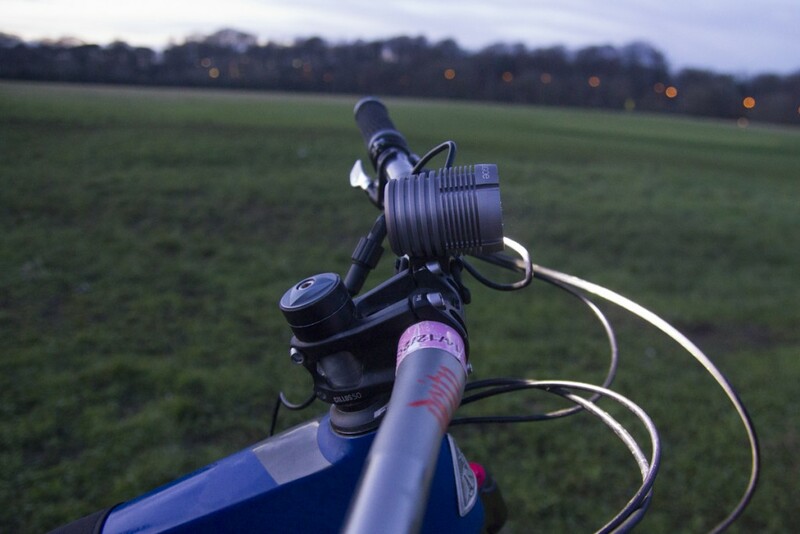 I prefer to have my most powerful light on my bars and found it was easiest to just adjust the front light directly, using the button to shuttle between modes. It worth noting however, that the light can get a bit hot when it’s been on for a long time. The verdict? Well, £160 still seems a lot for some lights, but these are very good indeed and get my thumbs up! Nice review, where did u get them & are they still working ? Just came across this post, do you still know if they still make this light, and if so where I can find it?